Do Not Give Up. We Will Overcome This Crisis Together. Rest in Peace, Brother Abdul Saleh. Brother Saleh was a yellow cab lease driver who served the city for over 30 years and took his own life at the age of 59. Reach out for help. It is there for all of us. Unite to win change. Together, we have the power. If you or someone you know needs to talk about feeling depressed, call The National Suicide Prevention Lifeline at 1-800-273-TALK (8255). Please know we are also here. You can come to the office to talk or even just to relax and be in the company of fellow drivers and all of us at the union who stand with you. We are together. On Eid al-Fitr, a day that Muslim families come together to celebrate the end of the holy month of Ramadan, Abdul Saleh took his life because he saw no end to the burden of poverty. Six of our brothers have now committed suicide in recent months, their livelihoods devastated by a business model that fails to recognize the basic humanity of the workers who keep our city moving and by a political system that prefers sound bytes to solutions to economic desperation. Brother Abdul was 59 years old and he should have been planning for retirement and rest after 30 years of serving the public and the city, but instead he was exhausted by the cruelty of ending each 12-hour workday with less in his pocket than the day before. Many aging drivers no longer see retirement in sight and can't imagine continuing to work such a grueling job until their last day on earth. These suicides from financial desperation come at a time when income inequality is at a record high and after the CDC acknowledged that economic hardship increased the risk of suicide. This is more than a mental health issue. We will not allow the status quo of callousness toward struggling drivers to continue for one more day. We will not sit idly by as Wall street behemoths and their shills try to derail regulation or limit it to just one sector of drivers when every driver in every sector - including yellow taxi lease drivers, yellow taxi owner-drivers, green cab drivers, livery drivers black car drivers, and app-dispatched drivers - is sinking deeper into profound desperation. Suicide can't be the only way that desperate poor people find mercy. Our Momentum is Building! Our Movement is Growing! We Must Keep up the Fight 'Til Victory! Our May 29th Rally for City Council Action on Our Demands covered Broadway from Murray to Warren! The strength of our unity was being tested, and we delivered! Together we said, "Stop the Greed! Regulate Wall Street!" and "One License! One Meter!" We must keep up the pressure for our demands and keep City Council honest! Look up your Council Member at this link by entering your street address & borough and voice support for our demands. Let's flood their offices with calls to say: We Need Action Now!" On May 27, 2018 NYTWA held a vigil for brother Kenny Chow, a yellow cab owner-driver pushed to suicide by financial ruin. His family and friends feared suicide after his vehicle was found abandoned on East 86th Street and East End Avenue, near the East River on May 11th. Richard Chow, Brother of Kenny Chow, praying at vigil on May 27th, overlooking the East River at 86th St & East End Avenue. 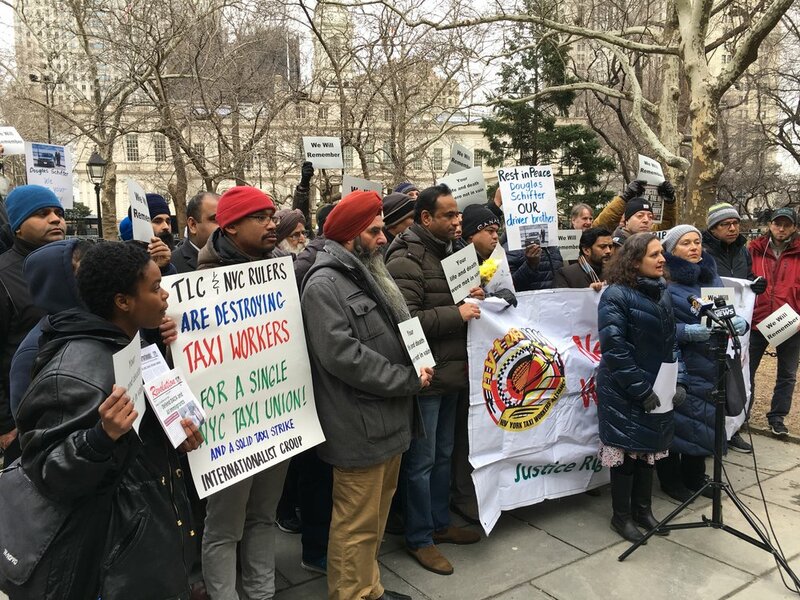 On Wednesday, March 28, NYTWA members, including yellow cab, green car, black car, and app-dispatched rivers, gathered on the steps of City Hall to mourn four colleagues who committed suicide in the past four months and to demand immediate action by the Mayor. Drivers stood with Gabriel Ochisor, the son of Nicanor Ochisor, a yellow taxi owner-driver who committed suicide on March 16th. Drivers gathered to also honor and remember Danilo Corporan Castillo and Alfredo Perez, Bronx livery drivers, and Douglas Schifter, a black car driver. All four drivers were pushed to financial ruin by unregulated Wall Street darlings Uber and Lyft who in 2016 had more lobbyists than Walmart, Microsoft and Amazon combined. Meanwhile, an MIT study found more than half of Uber drivers earn below minimum wage. We must stop treating the devastation of people's lives as inevitable. We cannot allow Uber to continue to destroy lives for a business model that hasn't even been proven sustainable. We must come together now and demand protections for ALL drivers and for rational regulations that level the playing field. Two days after the City Hall Demonstration, Mayor de Blasio said it was time to consider regulating companies like Uber and to put a cap on the number of for-hire-vehicles. We must continue to put pressure on our elected officials! NYTWA members chanting, "We Need Action Now!" in the wake of four driver suicides. To see more photos from the City Hall demonstration as well as photos of members mobilizing for the action, please see our Facebook photo album featuring drivers from all sectors of the industry and all walks of life. Nicanor Ochisor, who took his own life on March 16, was an immigrant worker and yellow taxi medallion owner-driver who drove with his wife, an increasing pattern among drivers' families working around the clock without time to rest or recuperate with loved ones, adding to the crushing devastation of poverty. Nicanor lost his life savings and was pushed to financial ruin when New York City broke its promise to professional drivers. If you are interested in supporting the Ochisor family, they have started a GoFundMe campaign to pay off his medallion so his wife can finally retire. On Feburary 6, 2018 we held a vigil in honor of driver brother Douglas Schifter. In his final words, a suicide note he posted on Facebook, Douglas wrote that the saturation of for-hire vehicles destroyed his full-time job and pushed him to financial ruin. "It's An Emergency for the City's Drivers: Start Acting Like It, Mr. Mayor"
"I've been to more hospital rooms, ERs, eviction proceedings, immigration hearings, police precincts and funeral homes than I can remember. When you organize taxi workers, it's part of the drill. But in my 21 years, this month was our first vigil for a driver who committed suicide due to the despair from a fleeting full-time job..."
Watch our interview on Democracy Now! about Douglas' powerful post, the crisis facing drivers, and the political structure that protects Wall Street's gig economy. New York Times columnist Ginia Bellafante spoke to NYTWA about the increasing struggles faced by NYC drivers. "A Drivers' Suicide Reveals the Dark Side of the Gig Economy"
"In 2013, there were 47,000 for-hire vehicles in the city. Now there were more than 100,000, approximately two-thirds of them affiliated with Uber. While Uber sold that "disruption" as positive for riders, for many taxi workers, it has been devastating."